I was surprised at the very nice quality,look and comfort of this extremely inexpensive helmet.It is light.comfortable and fits wonderfully.The look is just as good as my more expensive helmet.Delivery was fast and was packed with great detail and care. I would recommend this helmet to others.Very satisfied. great looking, light weight, great fit I measured for a medium on the high end of the scale, bought a large and it fit great. big shell and a lot of padding. I bought a blue it matches my Yamaha xt250 perfect, the biltwell visor fit perfect. great bang for the buck. have not tried it on the bike yet will do another review on the noise and visor. Bought the Gmax MG2 open face helmet (matte black, size small) about a month ago, very happy with it so far. Fits very comfortably, the size chart on the website was right on, just make sure you measure your head correctly. The helmet is nice and light and does not restrict vision. Came with a visor that snaps on easily. Air flow through the closeable vent ports seems sufficient, although I haven't worn it in hot weather so can't say how it does in hot/humid conditions. On the downside, I'm not crazy about how it looks on me - it was rounder than I thought it would be - but once I put my sunglasses on it looked better. The matte black finish scratches VERY easily - much more so than the gloss finish on the wife's Gmax MG2. Also wish they had put a snap on the chin strap to keep the tag end of the strap from smacking against the side of the helmet when riding at highway speed. Overall a really good deal for the price, and VERY fast shipping. I would recommend this helmet to anyone looking for a comfortable, inexpensive helmet for fair weather use. Definitely would NOT recommend the matte black finish as I indicated above. Good helmet for the price bought for a trip to use one time but I will use this helmet for every ride. Quality , comfort , and price . Great helmet for the price . It's light weight and perfect fit makes this helmet very comfortable . The padding around the ears cuts down a lot of noise . This helmet also looks great . I plan to eventually buy another one for a spare . I would highly recommend this style helmet . I bought this helmet for my MSF class a few weekends ago and didn't want to drop a lot of money on a helmet if I found out riding wasn't for me. I was nervous that it would be bad quality because of the price but it is wonderfully made. I found out how protective it was when I laid my bike down during my class (It was my first time on a bike) and hit my head on the pavement. Because I didn't have a jacket, my elbow and knee got banged up but my head was perfectly protected. If you are looking for a helmet that gets the job done without breaking the bank, this is an excellent choice! I found that finding a helmet to fits was easier here online than I thought it would be. You just need a sewing style tape measure to be really sure of the fit but a flexible tape like from the hardware store will work as long as you wrap it around your head tight enough. Great Value for your Buck! This helmet is a great value for the $. I was a little concerned just because it is a lot less expensive than other models that are similar, but can't complain one bit. The fit is true to size, I wear a 7 1/4 hat, ordered a M, fits like a glove. I know, from experience, that the padding will mold a little after some wears so at that point I will have a little more room, so not worried about it being too tight or anything. The matte black is true matte, no smudge look. The padding is comfortable and the ear cut outs are perfect. I don't feel like my hearing is muffled at all. I like that it has the rubber molding around the edge instead of the chrome. It came with a cruiser visor in box. I didn't realize it came with it, so that was a fun surprise. Not sure I will use it, but nice to have it and not have to pay extra for it later. The only negative I can find is that I wish the strap had a snap/button to keep it from slapping me in the wind, but my wife added one, so that's all good now. I would definitely recommend this helmet to anyone wanting this style. I truly can't complain. I have to give it to Revzilla as well. They processed and shipped this order way faster than expected. I have ordered from other sites before and never have had this fast and accurate of service. The price beat all other vendors pricing, they pick up the tax, and it was free shipping. Better than shopping from a local store. Way to get it done! First time rider and this looked like a good choice. Excellent reviews online! At this moment for the price. I hope the quality is good or over. Easy and simple head protection and price. I bought this helmet simply for the fact that I needed a 3/4 helmet for my safety class. It is simply not my style, and looks ridiculous on my smaller than average head. 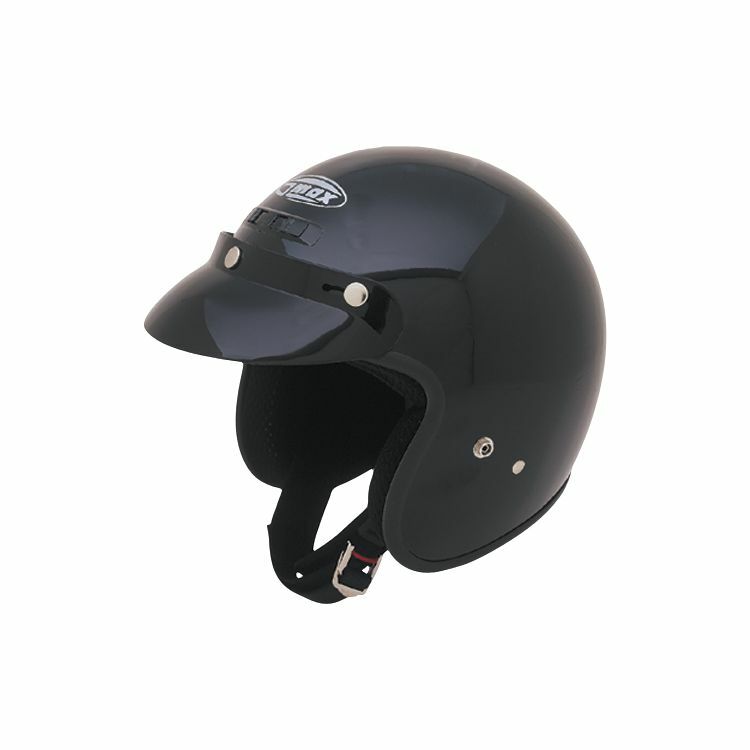 If you need an inexpensive helmet, this will get the job done, and be a great back up helmet. This helmet however is rather bulbous and will make you look like a bobble head, if you are a smaller individual. purchased the same helmet in large flat black but I think I needed a medium. you can't have to many helmets. Nice price for helmets for my kids. We ride ATVs and found that the full helmets are too large when double riding. Bought these last year for the grandaughters and these are perfect for the grandsons. I was looking for a good deal on an inexpensive helmet and revzilla was suggested by my son. I may buy another helmet soon. I picked this helmet for it's looks and the price as I drag race lawnmower tractors and only get to about 40 miles per hour and don't need the more expensive helmets. I have one of these already. My wife tried it - now I have to get another! I got this for my wife and I ended up keeping it for myself. Very good for summer, I use the biltwell faceshield with this. great combo!! good price for the item. i have a full face helmet and i was looking for a half face helmet for the warm weather. Best price for the exact helmet i wanted. Will a Biltwell bubble shield fit on this helmet? I bought the 3 snap Bitwell bubble shield with this helmet and it snapped right on! BEST ANSWER: Yes, it is clearly marked on the helmet. Also, this is a nice helmet. will it fit open face helmets gmax ? Can the liner be removed and washed?